A complete and balanced natural supplement. No ethoxyquin, BHA or BHT. 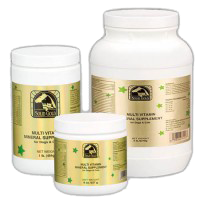 Our Multi-Vitamin/Mineral is in powder form to allow it to be easily mixed in with the food. This product can be used alternately with Solid Gold SeaMeal, if desired.